The Yankees' and Twins' young players delivered a long, crazy, exciting wild card game, making the most of a format that isn't always fair, but is definitely fun. On Tuesday, I arrived at the legendary terrarium for rich people in the Bronx just as baseballs were beginning to leave it. The Twins' Brian Dozier sent a pitch in the general direction of Europe and we were off. 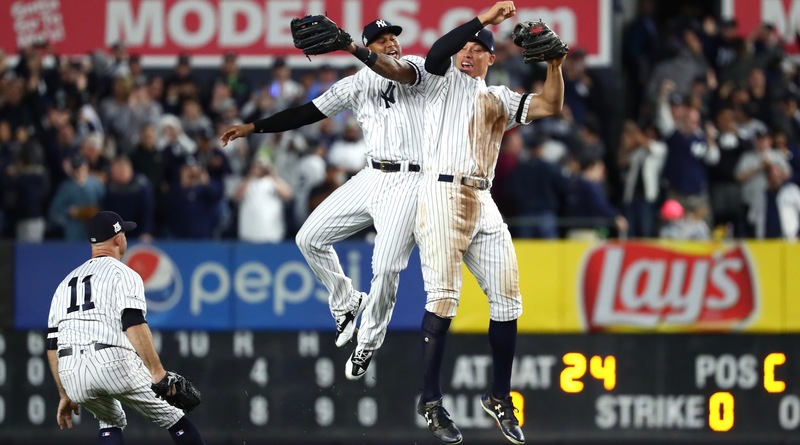 The American League Wild Card game, won by the Yankees, finally, 8-4,in the whiskey hours of Wednesday morning, proved a number of things. Foremost, it proved the ancient baseball counter-factual that the more that’s actually going on, the more time there is for nothing to go on, and that the more frenetic the pace, the longer the game. The first inning on Tuesday night dialed this truism up to 11 and then kept going. The Twins' veteran ace, Ervin Santana, fared no better than young Severino had. He put two men on and then Yankee shortstop Didi Gregorius tied the game by planting one in what ordinarily would be called the cheap seats, except that, you know, nothing’s cheap in the Big Ballpark. Minnesota manager Paul Molitor then provided us with the first serious second-guess opportunity of the postseason by staying with Santana. One inning later, Brett Gardner undid that decision by taking Santana into the not-entirely-plutocratic precincts in right field, giving the Yankees a lead they would not relinquish for the balance of the evening. Severino and Santana combined for 80 pitches in the first inning. All the pitchers combined for 201 pitches over the first four innings, which took two hours and seven minutes to play. Time slowed to a crawl because there was so much going on. Baseball occasionally makes no sense at all. I am an unabashed fan of these wild card games. Win-or-go-home is the most compelling scenario in all of sports. (After all, without the concept of win-or-go-home, the annual NCAA men’s Division I basketball tournament wouldn’t have become the beloved annual festival of unbridled avarice—nor the unbridled festival of criminal conspiracy, if the FBI is to be believed—that it has become.) I know all the arguments against them: they devalue the regular season; they are inherently unfair because of all the things that make them compelling for baseball agnostics like me, and they start too late at night and disadvantage the team that moves on because, as was the case Tuesday night, events can transpire that completely banjax the winning team’s pitching staff. The scenario was further intensified by the fact that both teams depended vitally on very young players. Severino, the Yankee starter, is 23. Rosario, whose home run chased Severino, is 26. Aaron Judge, the rookie star who has recovered his swing in a very noisy way, and whose fourth-inning home run gave the Yankees a 7-4 cushion, is 25. Byron Buxton, his Twins counterpart, who had to leave the game after injuring his back while making a tremendous catch against the centerfield wall, is 23. Throw players this young into this kind of roiling emotional stewpot and you are guaranteed something memorable, for good or ill.
Judge is probably the best example. He was the sensation of the season, ending up with 52 home runs. Yet there was still a great deal of uncertainty as to how he would react in what could very well have been a one-game postseason. (Judge came out of the All-Star break struggling so much that Girardi finally had to drop him down in the batting order to take some of the pressure off.) On Tuesday night, Judge not only hit the critical home run, but he also was in the middle of the Yankee rally in the first inning and, in the seventh, smart baserunning allowed him to score another insurance run. Judge, it appears, will be fine. “When I look at Aaron, there's a smile on his face a lot, and he just—there's just something about him the way he carries himself that you just feel really good when he's around,” Girardi said. Baseball turns to series play now, and it’s possible, though unlikely, that we’ve seen our last real sudden-death (for both teams) game of the year. That would be unfortunate. Games Tuesday night's are both high drama and a carefully calibrated metric by which to take the measure of your players, young and old—but mostly the young ones. Back in the days when ballplayers were low company, and before the game surrendered to higher math, back before we found it necessary to know that Aaron Judge’s home run had left the park at 107 mph and at a 19-degree angle to the horizon, it was a baseball cliché that young players didn’t feel pressure because they didn’t know any better. That’s no longer true. Maybe it was never true. Maybe young players were just closer to the game of the game. Maybe they understood why the unchanging verb of the game is that you play it.